Zion National Park is one of the most popular national parks in the country. Each year, millions of visitors from around the country (and even the world) walk through Zion’s incredible nature. Zion National Park is rich in natural beauty, history and wildlife, and an incredible way for park visitors to experience the wonders of Zion on a budget is through good old fashioned tent camping. There’s something about being able to sleep under the open stars, listening to the soft trickle of a stream close by, or the melodic hum of insects. 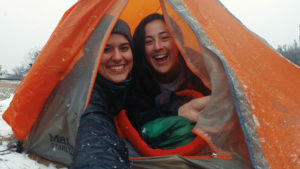 There are several areas around Zion where you can camp in your tent, but because National Parks are protected, there are rules that need to be followed and certain etiquettes that should be taken into consideration. There are three campgrounds in Zion National Park. In Zion Canyon, there are the South and Watchman campgrounds. The Lava Point Campground is on the Kolob Terrace Road. 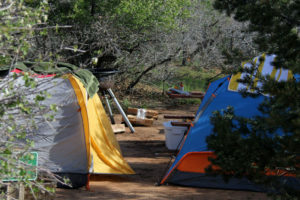 Camping in Zion is very popular, and the campgrounds are often full by mid-morning. During the busiest season the campgrounds are full almost every night, and getting a spot of your own can feel difficult if not impossible. However, you’re in luck: There are also incredible campgrounds near Zion National Park, offering you the amazing experience of desert camping while still remaining close to all of Zion’s attractions. Zion Ponderosa Ranch Resort has tent camping near Zion National Park with a restaurant on-site, so you can roll out of your tent and get a big hot breakfast, first thing in the morning. While camping in or around Zion National Park, you may come across wildlife, like squirrels, wild turkeys or mule deer. Feeding and harassing the wildlife you come across is prohibited, so be sure to observe them from a safe distance. As stated earlier, camping is permitted in the park, but only in designated areas. This is in large part to protect the park’s cultural and natural resources. To help protect the park, make sure you stay on the trails, and don’t walk or set your tent up on plant life and other non-designated areas. Campfires are prohibited when fire danger is high, so make sure you check before you plan your trip. Collecting wood within the park is prohibited, so make sure you bring wood with you. Fires are also only allowed in established fire rings in the campgrounds. If you’re camping with a big group, you may need a special use permit. National Parks, wilderness areas, and other wild spaces encourage visitors to practice and etiquette called Leave No Trace. This means it’s important to leave as small of impact as possible. Make sure you pack out all of your trash, and try to leave the campgrounds cleaner than how you found it. If you’re near water camp at least 200 feet away from it, and camp a quarter mile away from springs. Leave No Trace also includes human waste and related products. Try to use restrooms if you can find any, and if not, it’s important to pack out any toilet paper, feminine hygiene products, diapers, and human waste itself. In some wild spaces, some people may say you can bury your waste, but in the desert, it is considered most ethical to pack it out. Temperatures in Zion National Park can grow quite chilly at night all year round, but especially during the winter months. Make sure you bring the appropriate bedding, sleeping gear, and clothing to enjoy tent camping safely and comfortably throughout the year. If you’re worried about the cold, you can get a camping experience with added warmth by staying in a Conestoga Wagon or Cowboy Cabin.